Collins Booksellers - Among the Islands by Tim Flannery, 9781921961601. Buy this book online. Tim Flannery takes us on an enthralling journey through some of the most diverse and spectacular environments on Earth. Twenty-five years ago, as a young curator of mammals from the Australian Museum in Sydney, he set out to research the fauna of the Pacific Islands. Starting with a survey of one of the most inaccessible islands in Melanesia - Woodlark, in the Trobriands Group - that young scientist found himself ghost-whispering, snake wrestling, Quadoi hunting and plunged waist-deep into a sludge of maggot-infested faeces in search of a small bat that turned out not to be earth-shatteringly interesting. He includes accounts of discovering, naming and sometimes eating new mammal species; being thwarted or aided by local customs; and historic scientific expeditions. 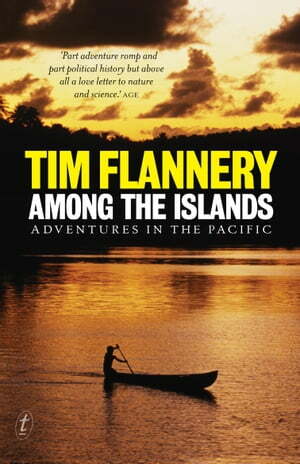 Among the Islands is the third book in a loose trilogy of Flannery's adventures, following on from the bestselling Throwim Way Leg (1998) and Country (2004). Tim Flannery has written over a dozen books, including Here on Earth; the award-winning bestsellers The Future Eaters, The Eternal Frontier and The Weather Makers; and his accounts of adventures in Papua New Guinea and Australia, Throwim Way Leg and Country. Tim was the 2007 Australian of the Year.